Mat 10:16-22 “Behold, I am sending you out as sheep in the midst of wolves, so be wise as serpents and innocent as doves. (17) Beware of men, for they will deliver you over to courts and flog you in their synagogues, (18) and you will be dragged before governors and kings for my sake, to bear witness before them and the Gentiles. (19) When they deliver you over, do not be anxious how you are to speak or what you are to say, for what you are to say will be given to you in that hour. (20) For it is not you who speak, but the Spirit of your Father speaking through you. (21) Brother will deliver brother over to death, and the father his child, and children will rise against parents and have them put to death, (22) and you will be hated by all for my name’s sake. But the one who endures to the end will be saved. In this ministry at Unholy Charade and Light for Dark Times, we often come across people who identify themselves as “advocates for victims of abuse.” Now that is a very good thing – to be an advocate, to be one who speaks for victims. But with a fair degree of regularity we hear from such people and are left to wonder – do they really grasp this evil? Have they personally experienced it? In people who have not been the targets of this wickedness, or who are still oblivious to what it really is, there remains a blindness. A lack of experiential, Spirit-given wisdom about it. And as a result, they really are not qualified to be an advocate for abuse victims. At some point they will fail those they claim they want to help. They will give false counsel and they will excuse the abuser. True pastors (and true Christians) will experience evil and abusive people. It goes with the territory. If a pastor can’t wrap his brain around the idea of evil and how evil operates, well then one must question whether he is a pastor at all. Every true Christian is hated by the world. Darkness hates the light of Christ that is present in us. But only when we realize what these attacks are, what motivates them, what their source is, do we become wise as serpents in regard to the serpent’s methods and tactics. This is really another test of whether we truly know Christ or not. People who remain willfully blind to the existence and strategies of evil, who refuse to recognize it especially as it shows up in the church….well, such people must not have assurance that they know the Lord at all. In other words, for the genuine Christian in a local church, the contradictory beliefs are 1) The claim of those around me that they are also real regenerate people, but 2) Their attitudes and behaviors do not square with the Bible’s statements about who a real Christian is. Therefore I have this stress, this tension in myself which I try to resolve. And the way we usually resolve it until we understand what the truth really is, is to assume that my observations and judgments either about the people or about Scripture, must be wrong. At times it has been an almost crushing weight of truth to realize that people (many people) are not who they portray themselves to be. You’ve probably heard of the term cognitive dissonance – our mind’s attempt to mesh together opposing beliefs or values into something that makes sense for our reality. That term probably sums up for me much of the last 25 years of my life. 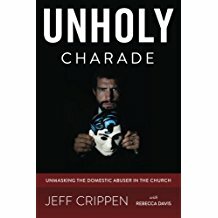 My husband was not who I thought, members of my family, practically my entire church – none were who I thought them to be- and in ripping away the veil which had shrouded those people, it’s as though God ripped away a bigger, wider veil. He has shown by so many examples that the majority of people who call themselves believers and attend church are fakes. It’s been shocking and incredibly painful. Yet truly God has been kind at the same time by also bringing a few wonderful, genuine believers to come alongside us, and for us to bear their burdens in return. What He has made more clear to me is that there really is an ultimate and continual conflict between good and evil – there always has been since the Garden. It’s everywhere and all around us and yet I didn’t see it, not really, not like this, until the evil of my husband and my church was exposed. But as G.K.Beale says [in his commentary on Revelation] there is a remnant. A small part which faithfully maintains its witness, thanks be to God. This is also what I had begun to feel as the dust settled a little and I looked around. There are those who truly and sincerely love God and want to please and obey Him. They’re real. We may be scattered, but we’re never too far apart, never without hope and encouragement. God never fails to give it. And there you have it. The cognitive dissonance created by hypocrites and the shocking yet refreshing experience that comes to us when the Lord takes away the veil, opens our eyes to reality, and sets us free of the enemy’s deceptions. 1Co 2:1-2 And I, when I came to you, brothers, did not come proclaiming to you the testimony of God with lofty speech or wisdom. (2) For I decided to know nothing among you except Jesus Christ and him crucified. The point Spurgeon was making of course is that genuine pastors, and true Christians, do not put on airs in their speaking in order to be seen as unusually pious and godly. The thing is repugnant to a real child of God.